I saw it somewhere on someone’s blog….long long ago. So….here’s to you….blogger with really great taste and awesome ideas with that incredible blog that I read two years ago, but can’t remember where. You are a rock star wherever you are. You inspired me to want my own monogram. And I found it in an old file. And I ordered it. I might even go so far as to say brilliant. I ordered it in unpainted wood and painted it with a little SW Intellectual Gray and a little SW Repose Gray and topped it off with a little SW Mindful Gray. As my husband pointed out, who knew gray could be so introspective? It makes me so happy. Every time I open the back door, I smile to myself and I secretly pat myself on the back. Much better design choice than the tiny bits of vine and leaves on my dining room table. I ordered the monogram here. In the interest of full disclosure the monogram company did not send this to me in exchange for a shout out on the blog. They don’t even know me. They aren’t a sponsor. I don’t even have sponsors. I think I post too much on dust bunnies and overpriced hand lotion for that. In this case, however, I might make an exception. PS My husband wanted to make sure he got credit for the gray joke. You see, it’s all about starring on the blog around here. PPS I am partying at Kim’s and Susan’s. 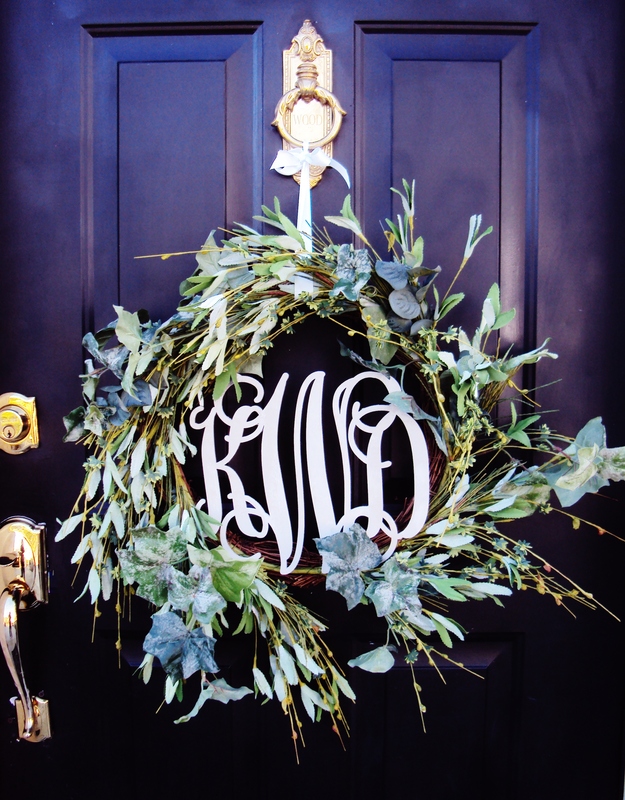 LOVE the monogram and the beautiful wreath hung from a ribbon from the knocker…genius. Love it and just had to laugh about your husband’s response! And I was thinking what a star thing to say…Brilliant doesn’t even begin to describe how awesome-hot-fudge-sauce that is. It looks wonderful! I may have to order one for myself. We can have battle of the husbands blog post link party! Thanks for sharing….I plan to order something soon! Love the new wreath! The monogram looks perfect in the center of it! Thanks for sharing. Love that! I’ve seen that on Holly Mathis’s blog. I bet that’s where you got it from. She did a post about it and did get one for free for talking about it. Lucky her! I love how you added the wreath to it for your front door. I didn’t know you could buy them unfinished. That’s a good idea. AWESOME and of course you know that NOW, I want one, too. Adore the monogram in the wreath. but oh my, where did you get those amazing planters with the orbs(?) on them? Okay, l-o-v-e. But I’ll have to bookmark the site for later (and I can do that now because i have my laptop back — can you hear me singing???) because I gave up spending $$ for lent. You know, on fun stuff. And this definitely qualifies as “fun stuff”… though I could make the argument that our front door NEEDS this? Hmmm. I even linked back to my inspiration. A certain blog called Ask Kari and Kijsa. Loved that blog =)) ps I also ‘copied’ their black door idea by painting the interior of my front door black (in our previous home). It was gorgeous. Hey girl, your monogram is gorgeous, especially in all of those fancy named gray colors. It looks really pretty sitting inside the lovely wreath, too. Love your wreath. Just looked at the monograms.Lots of decisions. What size did you order? I have that monogram pinned on one of my boards! It is on the list of things to get!! It looks fantastic in your door wreath, and looks so sophisticated in it’s shades of gray! Thanks for reminding me about the monogram! I heart them BIG time also! P.S. Love the spheres you have over your plants by the door. Cool idea! Alright. That’s your BACK door. Back DOOR. The one in the BACK of the house? Behind all the good stuff, the showy stuff, the FRONT stuff? That’s the behind the scenes where WE ALL put our recycling bins and collected sticks from our walks in the hills, mud trodden boots, and poopy sneakers that “by mistake” stepped in the dogs’ doo. That’s where the REST of us HIDE things. Oh I see. That’s where YOU hang YOUR initials. The back door. And “every time you go out that door you smile secretly”. Yeah. That door. I think you are a computer generated human being. That’s all I got from the FRONT. You need to have an official audition for your family! Props, lighting … the whole shebang! I see stand up comedy, monologues, maybe even some miming! And of course, you standing down stage with a giant hook! 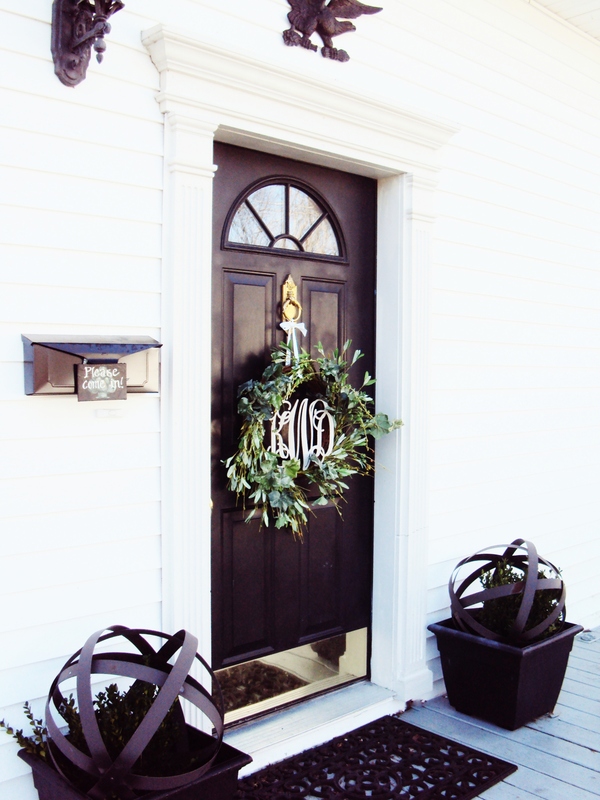 Love the monogram and your giant orbs (the ones in the pots – what were you thinking I meant)! Please tell what size monogram you ordered so I can click over and order one for my door too! I love monograms and yours looks wonderful on your door. What size did you order because I’m about to order one for my house. I also love the orbs in the pots. Was that a DIY project? Thanks for sharing. 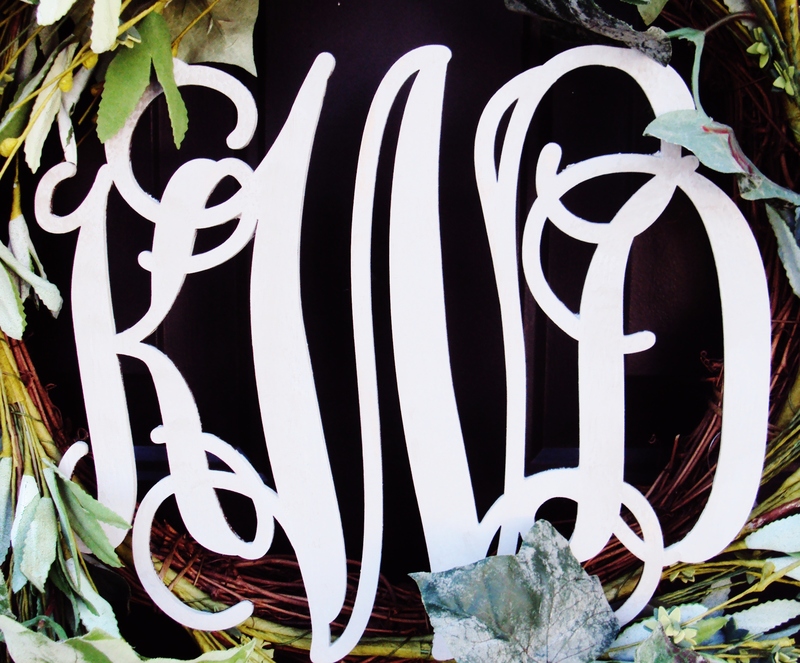 Karianne your monogram is fabulous and the centre of your wreath is the perfect place to stage it ! I love it ! Did you link this over at Between Naps on the porch? There is a porch link party going on right now! You decorate your back door so beautifully well, because you are of the mindset that backdoor friends are the best friends?…and you want your “best friends” to have such a warm and friendly welcome…Gorgeous, gorgeous, gorgeous…that’s 3 gorgeouses for the 3 letters..
You’re the best and BTW..tell hubby, “good one”…very funny!! it looks fabulous. and who knew gray could be so introspective indeed. I love the monogram and thanks for a laugh! I feel myself getting ready to click on your link for the monogram! Yikes! Have a Great Sunday! Karianne, I agree. It looks awesome. And, I am happy that you are happy/ Give yourself an additional pat on the back from me. Oh I bet they know who Thistlewood is! It looks great! Have a great weekend! Thanks so much for sharing the monogram – and your husband’s comment! Like several other posters, I was wondering what initials you put on the monogram. It is beautiful and can’t wait to order my own. I think you should get free monogram for all the orders the site will now receive!! Looks wonderful! Where did you get it?? It looks great, Karianne! I love it in your wreath! That’s a nice way to get a unique wreath. My husband must be the exception. He just helped me do a project and I told him I’d give him full credit on my blog. He didn’t look honored or excited. I do believe I need that wreath in my life!! I’m a wreath addict! My mom ordered me one for Valentine’s Day and I had posted about it in February. I love mine! Your’s looks great on your front door! I have one too! Got the idea from holly mathis. lovely–i also love the color of your front door…on my computer screen it looks to be a very deep plum/raisin?? Oh this is a beauty! 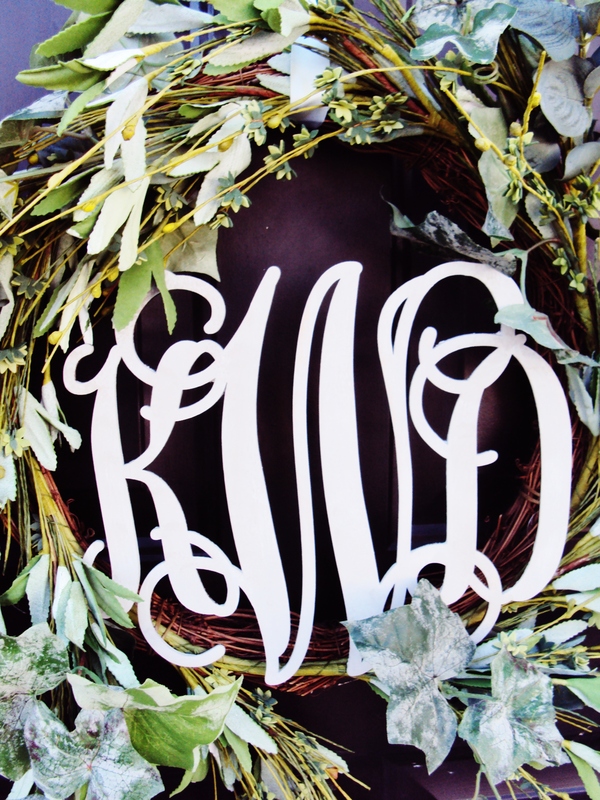 The monogram along with the wreath…I love it! You porch looks great. 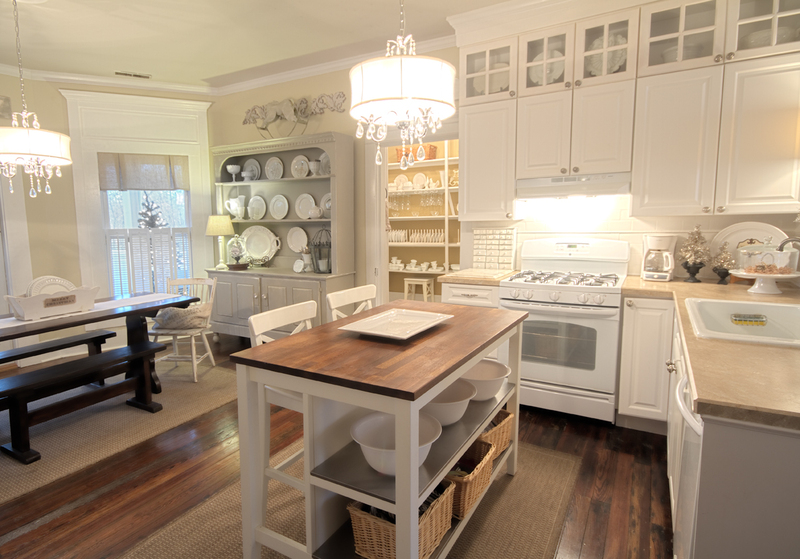 Great focal point.Love that monogram.Never saw that but a great eye catching idea. Totally adore the monogram, Kerianne. I think I have the same one pinned somewhere, too. I have double entry doors and don’t know if I’d want to spring for two, or it may look like overkill. Your darling husband sounds a bit introspective, himself. I love these monograms! I’m like you I’ve saved it somewhere and had forgotten about it. I would love to order one of these myself. Gorgeous! Looks great on your door. Oh, and I loved the gray joke. That looks wonderful. Yes, you are brilliant! I heart monograms – and this one is too cool! WOW!! So glad I found your blog. I’m your newest follower! I love the wreath, your style…classy! Beautiful monogram! I love the wreath too. 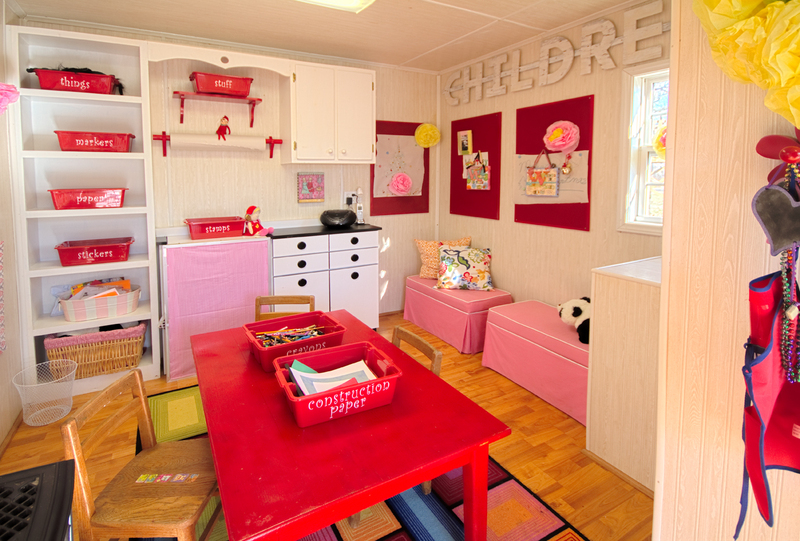 You should enter your door in the HGTV front door contest (http://hgtv.com/fantasticfrontdoor). Alas, I cannot enter because I am Canadian, but you should. Beautiful. In a previous lifetime, I use to paint aisle runners for weddings, so monograms were pretty much a daily obsession. I also ADORE your metal sphere thingys (for lack of a better term). Your shades of gray are smarter than I am! It is really, really beautiful. I love the whole look you’ve got going on! GORGEOUS! Did you make that wreath too? Love! I pinned one of these ages ago too; now I’m motivated to make the order. Thanks for linking up! I love your wreath. I have a beautiful “D” that’s waiting to go on a wreath. I keep thinking I need to paint it or something though. I’m definitely pinning yours. It’s perfection.